There are many different ways to water a lawn. Most people in the US and UK [and China, right? No?] use an underground irrigation system. But aside from the typical, there is a great majority of people that find other means to water their lawn and plants. Let's go over some of the common as well as not-so-common ways to water a lawn. Serious gardeners and homeowners don't mess around when it comes to their yard and gardens. For these well-decorated individuals, watering a lawn is more than just turning on the hose and hoping for the best. 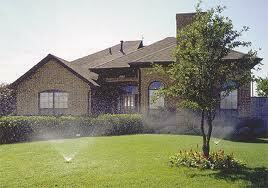 Business-oriented lawns require watering systems that are carefully planned, designed, tested, and installed. These sprinkler systems can be pricey, costing upwards of 2,000 dollars! But to some, it's a worthwhile investment for a number of reasons. Terribly Convenient - You don't have to worry about turning them on or off. Effective - Get your whole yard and garden watered without you having to get up and move the hose. But not only does it cost thousands of dollars to have an underground sprinkler system installed, they can be expensive to maintain and repair. Make sure it's in the budget before you start laying PVC. An affordable alternative to watering your lawn is with the Garden hose. With a garden hose and the proper attachments, you can water your entire lawn and even your medium-sized garden. You might have to get up every ten minutes and move the dumb thing but you're not forking out thousands of dollars all at once to have an underground irrigation system. So obviously inconvenience is a major draw-back, but hose faucet watering is not all that bad. 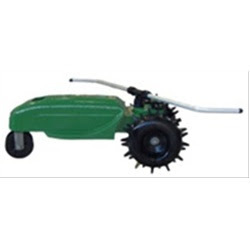 Unlike underground sprinkler systems, above-ground sprinkler systems open up a whole new world to lawn watering. You have so many different hose attachments and sprinkler heads to choose from and now, somewhere to begin! Let's get started with the basics. When using your garden hose to water your lawn, the closes you will ever get automatic watering is with a hose faucet watering timer. By connecting your garden hose to a hose faucet watering timer like the Orbit 91213, and then the timer to your hose spigot, your allow your lawn to be watered automatically. 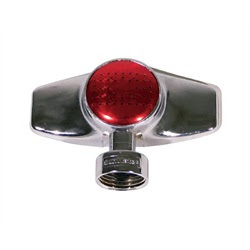 On most hose faucet watering timers, you can select the watering start and stop times. Which means the only thing you have to worry about is making sure one section of your lawn is not getting watered more than other areas. 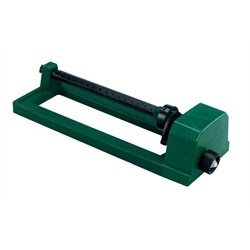 Even if you don't want to spend 20 bucks on an automatic hose faucet watering timer, you still have to decide which sprinkler hose attachment you are going to trust to water your lawn. Do you want the one that shoots straight up in the air? Do you want the one that twirls? Pulsates? Oscillates? Travels? Shoots water out of it's big blue trunk?? Let me help you decide. Read more comprehensive descriptions an earlier post about Pulsating Sprinklers. 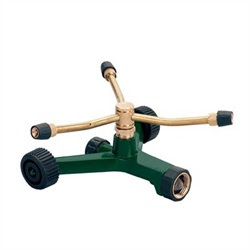 A great way to water your lawn in the summertime is to use fun hose attachments that your kids will love. From Beach Ball Sprinklers to Super Spriral Water sprinklers, you can water your lawn and entertain your children and their friends at the same time! I remember when I was kid, we had a garden hose attachment that looked like a big flower and it sprayed water out of the center of the flower while tipping and twirling in every direction. We would put this crazy water toy under the trampoline so it sprayed water up and through the bottom of the tramp. Water makes trampolines slippery and super fun! So whether you use an underground automatic sprinkler system, a hose faucet watering system, or a Wigglin Water Snake to water your lawn, I hope you have a healthy lawn and a great year!